Minutes after an earthquake jolted the Visayas on Thursday afternoon, July 6, a tornado slashed through the area and hit more than 20 houses and a structure in two villages. Francis Bermejo, head of the City Disaster Risk Reduction and Management Office, said two houses were destroyed while 20 others were damaged in Barangays Cabanbanan and Nabali-an past 4 p.m. Thursday. The tornado, which lasted for five to 12 minutes, toppled down trees and blew off roofs of houses, and of Cabanbanan Elementary School building. Nobody was injured, but about 22 families were displaced. Bermejo said some of the affected families sought refuge in evacuation centers while others stayed in their homes. Himamaylan City Mayor Agustin Bascon said that food packs were distributed to the affected families. He said that assessment of the damage is ongoing to determine who will receive financial assistance and construction materials. The mayor said the earthquake has nothing to do with the tornado. "Scientifically speaking, earthquakes can't produce tornado," he said, adding that tornado was formed after the heat on the ground converged with the cold air. 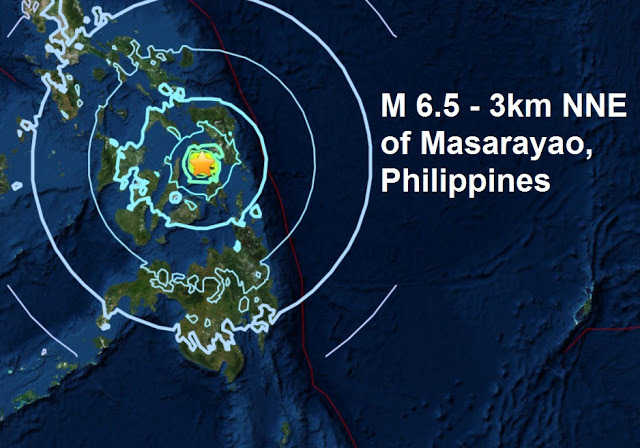 'Be prepared' For his part, Governor Alfredo Maranon Jr. told the public to always be prepared for disasters following the 6.5-magnitude earthquake that hit Leyte and was feltin Negros Occidental on Thursday afternoon. Maranon, who was at the Provincial Capitol in Bacolod City when the tremor happened, said the best way to prepare for disasters and calamities is through prayers. He said disasters were written in the Bible and it is sort of a warning and message to the public. "It's up to you how you take the message," he added. The governor said the locality's disaster preparedness would always depend on the resources. "Our resources are not enough. During Thursday's tremor, Intensity 4 was reported in Sagay City, Intensity 3 in Bacolod City and Calatrava, and Intensity 1 in La Carlota City. It also caused power interruption in some parts of Bacolod City after three substations of Central Negros Electric Cooperative tripped due to oversupply of power.